The idea here is to use the tremolo arm to emulate the kind of glissando effect normally obtained only by bottleneck players. You might find this interesting if you want to add a touch of that ‘slide guitar’ sound into your playing without having to raise the action of your instrument or worry about where to put the slide when you’re not using it. Jeff Beck: known to fake the odd slide. This technique will never sound exactly like guitarist playing with a real slide – there’s only one way to sound like an authentic slide player and that’s to become one! However, it is possible to emulate slide guitar to the extent that the listener will recognise what you’re trying to do and it’s an interesting trick to have up your sleeve. Check out Michael Lee Firkins’ eponymous debut album (on Shrapnel) and you’ll hear a player injecting slide licks into a genre of guitar-playing normally characterised by incessant sweep-picking and tapping, which gives a very distinctive and effective combination, unlikely though it may seem on paper… Let’s look at some of the technical issues which crop up in this style of playing. A fingerstyle approach to this kind of playing helps you achieve a slightly more authentic tone and offers greater control over the dynamics in the music. It also helps with the muting of unwanted strings, which is all-important with this kind of thing. You need to find a position for your right hand which enables you to pluck the strings and mover the whammy bar simultaneously. This is affected by a number of factors – principally the height of the bar above the strings and the length of the bar itself – but it’s normally possible to find a comfortable hand position that works. I find it easiest with the third and fourth fingers curled around the bar (enabling both upward and downward travel) and the thumb, index and middle fingers resting on adjacent strings. The thumb-side of the palm can then be turned inward a little to rest on the lowest strings and keep them muted. In many of the licks you’ll find in the transcription, you’ll notice that string-crossing is a prominent feature. For a lick like the one in bar 6 (beat 2) to work, you need to ensure that each note is cut off as the next one starts. Muting is made considerably easier if you make use of your fretting hand: in the lick cited above, you could pluck the c#, drop it to a B using the bar and then relax the grip of the left hand just enough to prevent the G string and the 6th fret from touching. You now have a nanosecond or so of silence in which to release the bar and pluck the A on the D string. Vibrato: experiment with the speed and depth of your vibrato, aiming to move between ‘slightly sharp’ and ‘slightly flat’ smoothly. It helps if the tremolo arm fits tightly into the tremolo block to prevent clunking noises through your amp, particularly on overdriven settings. Sliding into a note: Relevant notes are marked ‘TA’ in the tab and should be executed by pre-bending the bar down a tone or so, plucking the string and then bringing it smoothly up to pitch. Bending between notes: The start of bar 16 illustrates this technique. Pick the B on the D string, bend the bar down exactly a tone and then bring it back up. If you execute the bends fast enough and leave enough of a gap between them, you should hear the result as a three-note melody. Whenever the tremolo arm is used in this slightly more precise manner, the tab indicates it as TABU or TABD. The backing track is a simple dominant blues progression, so the obvious note choices are dominant 7th arpeggios in E, A and B. 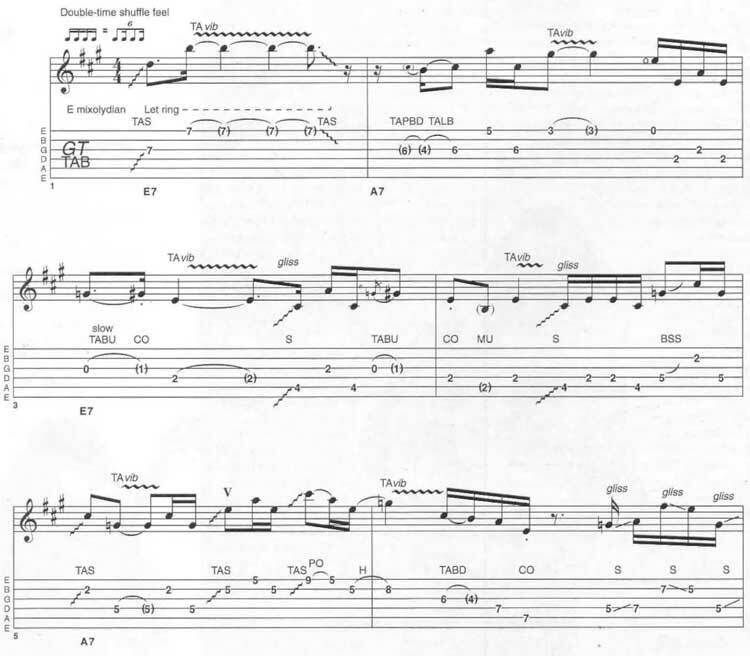 Basing your phrases around chord shapes containing these notes is a good way to sound melodic as well as offering the best way to emulate the sound of an open tuning without having to go to all the trouble. Have fun! Players who make good use of the ‘fake slide’ idea include Jeff Beck and Michael Lee Firkins. Of course, the best way to add a slide guitar flavour to your playing is to listen to the real thing… have you heard Sonny Landreth lately? It’s a part of Faking It. Slide guitar lesson. © 2012 - 2019 TabsClub Powered by TabsClub 42 queries in 0.320 seconds.